Look for the Contactless Symbol on the store’s checkout terminal. When prompted, bring your card within a few inches of the Contactless Symbol. Get the ok - a “beep”, checkmark or green light - and go! 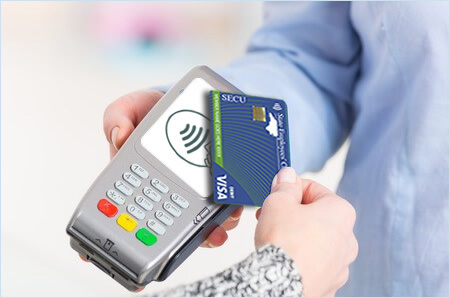 “Tap to Pay” is a feature on a contactless card that allows you to make payments via short-range wireless technology also known as NFC (Near-Field Communication). When you receive your contactless Visa Check Debit, or CPG card, you will be able to tap the plastic against the merchant terminal to complete a transaction. Contactless cards can be used any of the following three ways. How do you know if your card will “Tap to Pay”? You will need to look for the Contactless Indicator on the front of your card, to confirm that your card can perform the “Tap to Pay” transaction. You can “Tap to Pay” at any merchant terminal that has the Contactless Symbol . Can you use your contactless cards even if you do not see the contactless symbol? Yes. If you do not see the Contactless Symbol, you can still use the contactless card at an EMV checkout terminal by inserting the chip or swiping the card. Are you required to use the “Tap to Pay” feature on your new card? No. You can still insert the chip or swipe the card to complete a transaction if you would rather not “Tap to Pay”. Are “Tap to Pay” transactions secure? Yes, “Tap to Pay” transactions use the same security standards as traditional EMV chip cards. For every “Tap to Pay” transaction, a new and unique transaction code is created by the card and the merchant terminal that secures your payment information. Once the transaction is completed, the code for that specific transaction cannot be used again. “Tap to Pay” transactions also use the same NFC (Near Field Communication) technology as mobile payments, such as Apple Pay and Google Pay. Can people “skim” information off a contactless card? If your information is skimmed, the transaction code would not be valid therefore the information that was captured would be incorrect. Look for the Contactless Indicator on the front of your card, to confirm that your card can perform “Tap to Pay” transactions. When using the “Tap to Pay” function, you should hold the card within 1-2 inches of the Contactless Symbol. The card works best if held flat over the symbol instead of at an angle.